Tag line: "Every son holds the future for his father"
Sam Mendes’ Road to Perdition was the final film of cinematographer Conrad Hall, who passed away shortly after it was released. Like most of Hall’s best work, Road to Perdition is chock full of poetic motion and jaw-dropping imagery. The combined talents of stars Tom Hanks, Paul Newman, Daniel Craig and Jude Law, as well as director Mendes, made Road to Perdition a good movie. Conrad Hall made it a better one. 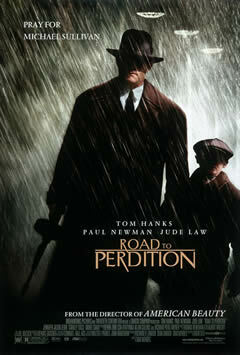 Set in the days of prohibition, Road to Perdition weaves a tale of betrayal and revenge. Michael Sullivan Sr. (Hanks) works as a hit-man for local crime boss, John Rooney (Newman). His young family knows nothing of what he does for a living, but when son Michael (Tyler Hoechlin) inadvertently witnesses a shooting, a chain of tragic events is set in motion. Before long, both father and son must take to the open road, running for their lives. But Michael Sr. has no intention of running forever, and is waiting for the right opportunity to strike back at those who've injured them. The performances are exceptional, with Paul Newman receiving a much-deserved Academy Award nomination for Best Supporting Actor. But Road to Perdition belonged to Conrad Hall. The film is beautiful from start to finish, yet one moment in particular impressed me above all others. It occurs at about the halfway point, when both Michaels are already on the run. Just before dusk, the two make a brief stop at a remote Catholic church. Hall positions his camera off to the side, in such a way that we see the front of the building and the stairs leading up to the main door, both silhouetted against a stunning, cloud-covered sky, barely illuminated by the setting sun. Father and son ascend the staircase, open the door, and enter the church. End of scene. The sequence lasts no more than ten seconds, and adds nothing whatsoever to the narrative. Yet as I sat in the theater watching this brief aside, I felt it was one of the most gorgeous moments I had ever seen captured on celluloid. I’ve watched Road to Perdition several times since then, and this particular shot never fails to inspire me. Whenever I see it, I’m reminded of just how exquisite the art of motion pictures can be. If a picture is truly worth a thousand words, Conrad Hall recited millions of them over his five decades peering through the camera's viewfinder. Having worked on such classics as Cool Hand Luke, In Cold Blood and Butch Cassidy and the Sundance Kid, it was somehow fitting Road to Perdition would serve as his grand finale. A violent film, yet one of elegance and beauty, Road to Perdition put the exclamation point on what had already been an extraordinary career. Totally inspired to go watch it again. I haven't seen it since the theatrical release.